Grandeur….elegance….opulence…Eve of Milady wedding gowns are best known for their amazing ball gowns and gorgeously detailed bodices. These trend-setting gowns give bides the feeling of beauty and romance every woman dreams of on her wedding day. Cathedral trains, chapel trains, trumpet, and fluted gowns, tulle gowns trimmed with lace and the most perfect empire waist gowns… Eve of Milady delivers them all with quality, style, and everlasting grace. 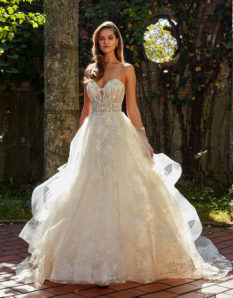 Gowns range in price from $3,000 – $6,500. Receive up to $500 off your Eve of Milady gown when ordered during this trunk show weekend!